Over the years, skincare routines have become more and more complicated. From a 3 step routine it has become a 10 step routine thanks yo the influence of the korean beauty industry. I spend a lot of time on my vanity table as new Products are constantly being added to my daily list. No, I am not complaining as I find all this a luxury. The luxury of being able to sit in front of the mirror without having to rush out the door or to attend to the kids. A big hug and kiss to the hubs for this, as he will be minding the kids when I'm sitting in front of the mirror. Lol. But this doesn't happen 365 days a year, there are days and weeks where I really have to rush out the door or rush to my laptop, times like this i would have to just cut short the routine into the simplest most basic routine! Thanks to Althea's exclusive line, I am able to cut it short without having to compromise on what's lacking. The Contour Cleanser from the Althea Bare Essential line is my Everyday cleanser, followed by the Real Fresh Skin Detoxer which is a 10 second Detoxer. Following this would be the Bare Essential Primer Water and Fixer Cream followed by the latest Althea Petal Velvet Sunaway and my most trusted and raved about Althea Petal Velvet Powder and I am good to go! So I am always excited when Althea comes up with a new Exclusive Product. Masking before bedtime or before putting on makeup the next morning is a must for me to make sure that my skin is at her best, but sometimes 10 minutes is not what I have got to spare. The latest addition to the Althea Exclusive line is a lifesaver at times like this as all it takes is just 30-60 seconds! I am proud to introduce to you the latest Althea Exclusive, my latest obsession. The ALTHEA MILK PEEL CREAM MASK! Milk as it main ingredient, this is definitely a great product for mornings or nights! Milk is known to contain many antibacterial properties as well as Vitamin B, Calcium and Alpha Hydroxy acids. We basically grew up with this ingredient one way or another. Lol. So we know milk is good! 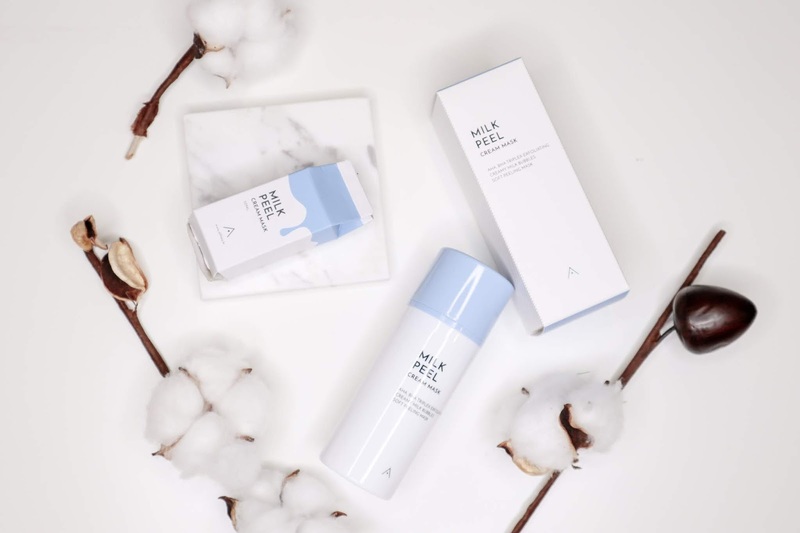 The Althea Milk Peel Cream Mask comes in a 50ml cute little white and blue pump bottle. This Milk Peel Cream Mask is suitable for all skin types as it has got a hypoallergenic formula which won’t irritate the skin. So if you have a allergic skin, you can use this too! Althea Milk Peel Cream Mask also contains both AHA and BHA extracts, a gentle but effective exfoliator. It is also formulated with casein protein to help revitalize and moisturize the skin. If you are like me and always worried about ‘peeling’ products because it always leave the skin dry, I can assure you that this doesn’t. I have very dry skin and I cannot afford to lose any of my skin’s natural moisture or else I will start having red patches and bumps, the Althea Milk Peel Cream only leaves me with soft, moisturized skin throughout the day. How do you use the Althea Milk Peel Cream Mask? It is easy! Damp you skin, and apply an even layer onto the skin and massaging it into the skin till a rich lather forms. Leave it on for 30-60 seconds before rinsing away with warm water. The Althea Milk Peel Mask smells like baby powder to me and I love it! It comes out of the bottle as lightweight clay and transforms into a rich dense lather from the microbubbles which purifies and soften the skin! There will be a tingling sensation just like any other bubble mask! After using this my skin is always soft to touch and I honestly can’t keep my hand off my face even more now! Get one and try it yourself! Did I mention that it is so affordable too? You can get the Althea Milk Peel Cream Mask at only RM36 on the Althea Website! Hurry now as there is a Free Shipping on Althea Exclusives [ yes, all the products mentioned above] ! Key in code PBSHIP upon checkout! Althea Bare Essential Cleansed, Prime and Moisturize! This is a simple 3 step skincare routine that will leave your skin feeling clean and moist! Protect your skin from the sun with this! No white cast and awful smell!